Edward's Roofing and Exteriors is proficient in making sure that our clients' homes are both beautiful and functional. With our years of experience, we can easily assess your home's needs and create a reliable end result that you and your family can enjoy for decades. Take a look at our areas of expertise below to learn more. 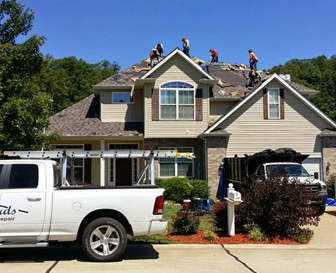 Our roofing services are thoroughly examined by each of our professionals for maximum wear and tear through Missouri's storm seasons. We use the finest materials to make sure that their siding and gutters are reliable, keeping water and other materials from entering the home. Our fence and deck services create exceptional outdoor areas that your family and friends are sure to love.